"... Mr. Goode had agreed to show me all about hunting if I would show him how to fly-fish and tie flies...."
Rob took up fly-fishing after inheriting his grandfather's fly rod. Disappointed with store-bought flies, he almost immediately began tying his own. Now a commercial tier, Rob uses techniques and materials that suit his artistic preferences and ties patterns that are frequently out of the ordinary. "Hmm." I'd never thought about it or heard of it. "Sure, I don't see why not." Mr. Goode had agreed to show me all about hunting if I would show him how to fly-fish and tie flies. We had tied a simple pattern by tying in a clump of marabou, leaving a portion for a tail, and then winding the rest for a body. I was explaining that the same technique could be used with many other materials, including pheasant tail fibers and even fibers from the wild turkey feathers he'd found on his farm, a conglomeration of hills sporting hayfields, one horse, one beehive, and long-dead four-inch tall chestnut trees. Goode himself is a wanna-be farmer, a weight lifter (obviously... the guy is huge! ), polite to a fault, and is still telling jokes about cows that he must have heard in Sunday School as a kid. He asks lots of questions (three or four times each), but is very charismatic. It is almost like conversing with a very big charming kid. So I answered his questions without a whole lot of thought at first, chalking it up to his innocent quests for understanding. Then I pictured the "mix" in my mind. Sure, why not? Use ringneck pheasant tail fibers, mix them with fibers from the wing feather of a wild turkey, and wind them on the shank similar to a pheasant tail nymph. At the vise, I experimented with combinations to match the mottled effect of the mixed fibers, finally arriving at the finished product. I had no idea what to call it. Looked pretty neat, was all I knew. Had to test it out. I took my new size 16 nymphs to the local tailwaters for trout. I waded out waist-deep in the steady current; the trout nicking the surface haphazardly as they usually do while taking the prevalent hatching midges. As the sun pushed up on the tree-lined hills standing sentinel over the river valley, I could see the flash of nymphing trout an easy cast out into the clear water. 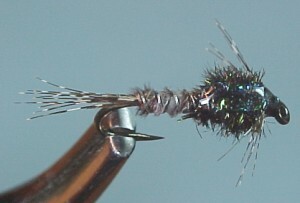 I tied on one of the new nymphs, and just as I was clipping the excess tippet from the knot, a dooming "clunk" sounded from around the bend upstream, followed by low-pitch twang speech and rattles. "Oh, no," I thought. Sure enough, here they came. A couple of good-ol-boys had decided to take the kin out on the river in their bass boat, spin fishing for trout. Apparently, the rocky shoals did not agree with their outboard and they were dead drifting, one bearded fellow in a white tank-top shirt and Merl Haggard sunglasses fiddling with the motor, the other bearded fellow in a red T-shirt and Merl Haggard sunglasses searching the boat for "somethin' ta fix it" but "cain't figger wot." The rest of the kinfolk were enjoying the day, whizzing what must have been half-ounce Rooster Tails from the boat and cranking them back in (a method I refer to as "chuck and pray"). I calculated their drift, read the current, and backed toward shore just as the boat swung around, pointing toward shore, and flowed silently over the spot I'd been standing in. They all looked at me as I watched them pass. "Sorry," one of the fellows said. "That's alright, no harm." I replied. "Nice day, isn't it?" They didn't answer. I warmed up my casting arm a little when I'd moved back into position, then stood still while I waited, smiling at the river otters as they snaked above and below the water's surface. A large blue heron glided upstream. Nature continuing despite the presence of man. Ten minutes and the trout were back to normal. A flash was considerably close and I chose this as my target. I cast upstream, letting the new nymph sink into place as it drifted right to the fish. The flash disappeared just as the fly reached the place, but suddenly came again as the leader twitched. I raised the rod to set the hook and could now see the fish, an average rainbow, as the sunlight flashed off the expelled nymph shooting from it mouth. "Missed it," I thought. The fly had shot out a couple of feet as I thought this, and the rainbow bolted forward and took it again ensuring a positive hook-up. A double take. Goode's Doubletake took at least a dozen more trout that day, some on the dead drift, others as I let the fly swing and retrieved it with short bursting strips. This latter got me thinking that this nymph might be good in water with little or no current. Another day for tests, this time right at the dam where the current is nil when the generators aren't running. This is Power Bait country. According to local custom, the only way to catch trout here is with marshmallows, corn, or the "purtiest" Power Bait in your box. Got there early and claimed a spot just before the crowd showed up. A couple dozen bottom fisherman molding colorful balls of dough connected to weight that would hold back a small barge, and one fly fisherman. Before I even started, I got many glances that seemed to say "Wot in tarnation?" They had just shut the generators down at dawn, and I tried a few patterns with no luck. A couple folks down the rocky bank had caught some small trout, lifting them high and behind them to the rocks so they wouldn't get away before being sown by a bright yellow stringer. Soon, though, no one was catching anything, and many comments of "ain't bitin'" flowed over the still water. The sunlight hit the water as it entered the valley and it was time to try the Doubletake. I tied one on, cast it out, and brought it back in with short strips, something like I figured a baetis nymph or similar insect might charge the surface to hatch. Five casts and five trout later I paused to look around. I had an audience. They didn't gather, but looked from their balcony seats, apparently deciding I was more interesting than their static rod tips. I chuckled and cast again. "He got another'n!" I heard as another rainbow did acrobatics above the water, then I listened for the gasp as I gingerly released it back into the water. This went on for about another hour and the Power Baiters started packing up. A spot that is always full and where all the locals rush to get to opened up, so I thought I'd go see what all the hullabaloo was about. I walked down the bank toward the spot, when a sudden commotion on the edge of my vision caught my eye. Roaring down the steep hill to the river, heading for the coveted "spot" was THE weekend warrior. He was running, arms out to the side to counterbalance a well-fed belly tucked into waders too small. Two spinning rods waved menacingly overhead, and a large metal fish basket chinked and flailed with every massive jolt. I wondered briefly how the Merl Haggard sunglasses stayed on and how long a white T-shirt like that stayed clean. He had apparently seen me heading for "the spot" and was determined to claim it as his own. No need to worry. The site transfixed me. I couldn't move. There was a short pause in the tumult when he looked to check my progress and failed to notice the depression in the hillside in front of him. He launched…. Have you ever seen those seals that slide down ramps on their stomachs? Me neither, but I bet it looked something like this guy! Memo to self: neoprene on grass at high velocity could be fun. I went back to my original spot and caught a few more trout before I left, a few strollers and departing fisherman stopping by on occasion to watch. Since then, the Goode's Doubletake has caught many fish in a variety of situations, and the local Orvis shop now carries a supply. It has become a standard in my flyboxes, both for trout and panfish. Give it a try! Fish it many different ways. Great imitation of a variety of nymphs and it's easier to tie than it looks!